And it’s worth the trouble. 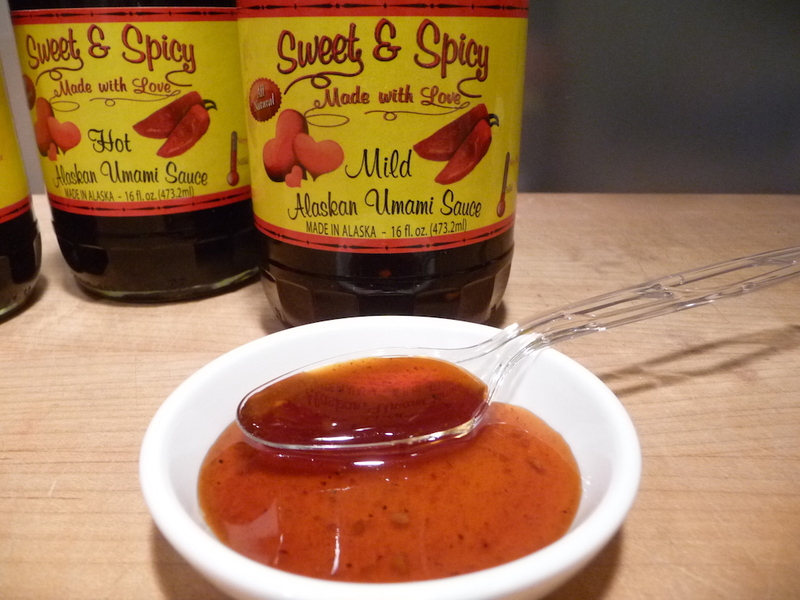 Sweet & Spicy Alaskan Umami Sauce is available in mild, hot and extra hot flavors. 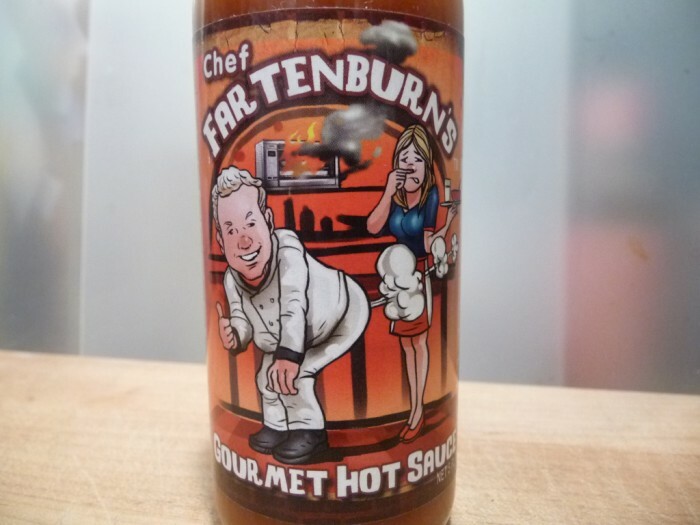 I found out by talking to sauce creator Pamela Turner as to why there is no “Medium” level of sauce. After having launched their Mild and Hot levels, they were inundated with requests for an Extra Hot version. Not willing to re-tool the labels for the Mild and Hot… Extra Hot was launched and the middle child, Medium, was left out. Very sticky, very sweet, very thick. Breakfast syrup sweet. Which is perfect for waffles you can make with your own frying pan, also is useful to know that the best splatter screen keeps you clean and safe when cooking another delight with your frying pan. A nice, middle of the road sauce for dipping. “Mild” ingredients: brown sugar, cayenne pepper sauce (cayenne peppers, vinegar, water, salt, garlic powder), vinegar, minced garlic, pure sesame oil, unsulphered molasses, granulated garlic, granulated onion, pepper, sea salt. Heat Level: – Very mild, sweet and sticky. 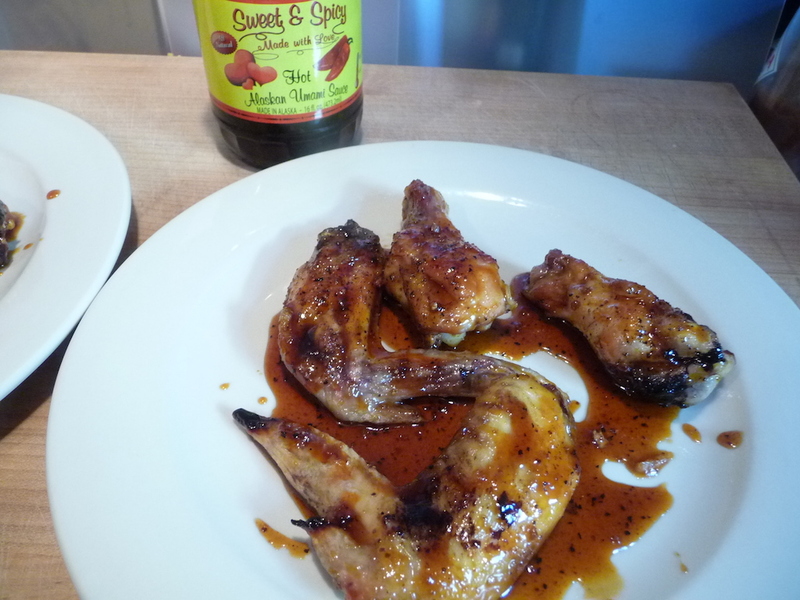 A nice glaze or substitute for pepper jelly. Tame. Overall Rating: – It’s pepper jelly good. Great for everyone to try. Good for: Probably best tossed in warm/hot wings after they’re done cooking. Also a great dip for pretzel sticks or poured onto breakfast sausage. Again, our first test was on chicken tenders as a dipping sauce. Wow. The best flavor/heat combo of the 3. A pop of heat in the mouth and up in the nose. When you swallow it, it burns your throat, but quickly subsides. “Hot” ingredients: Brown sugar, cayenne pepper sauce (cayenne peppers, vinegar, water, salt, garlic powder), vinegar, minced garlic, pure sesame oil, cayenne, unsulphered molasses, granulated garlic, granulated onion, pepper, sea salt. 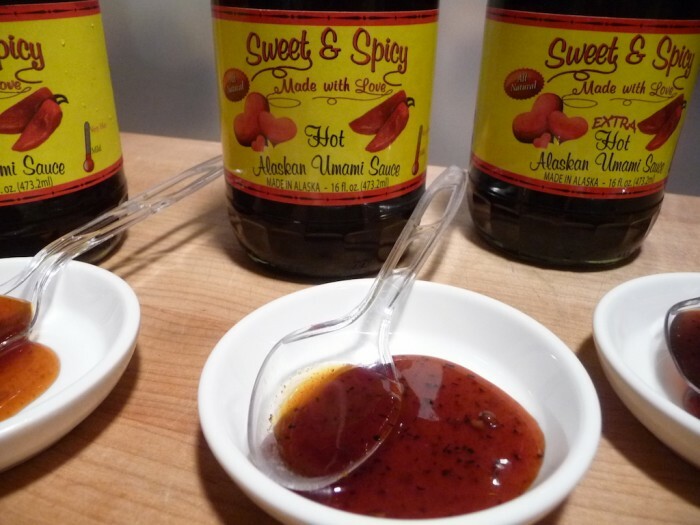 Heat Level: – Medium heat and best flavor of the 3. Perfect. 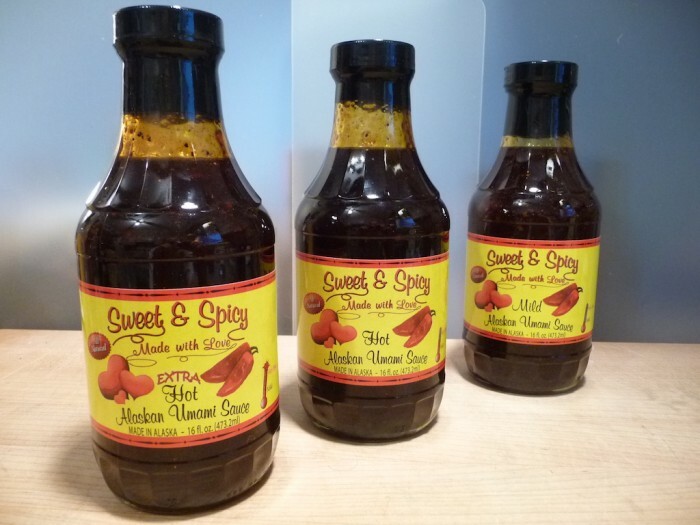 Overall Rating: – Our favorite and most flavorful. Recommended. Good for: Crackers with cream cheese, a wing glaze with some heat or a dip for jalapeño poppers. First of all, it’s indeed extra hot. Darkest red color of the trio. Lots of pepper flakes floating about. 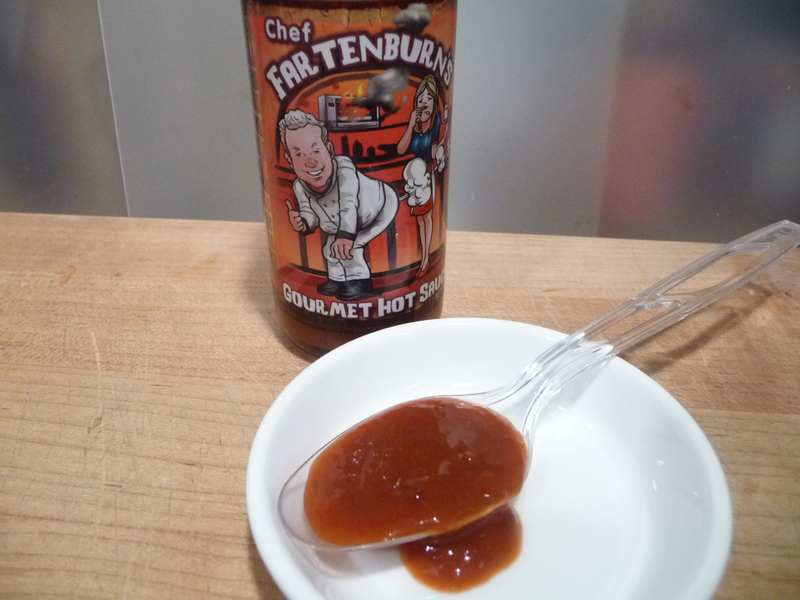 Too hot for my taste as a sweet dipping sauce. Think of this as a thin pepper jelly for the adventurous. 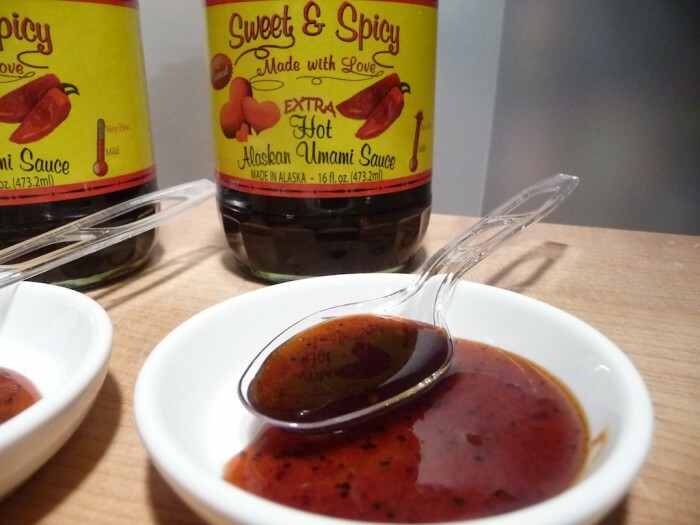 “Extra Hot” ingredients: Brown sugar, cayenne pepper sauce (cayenne peppers, vinegar, water, salt, garlic powder), vinegar, cayenne, minced garlic, pure sesame oil, unsulphered molasses, granulated garlic, granulated onion, pepper, sea salt. Heat Level: – Hot with far less sweetness. Hot. Overall Rating: – Hot for hots sake. A little overkill. Good for: Fire cracker grilled shrimp. 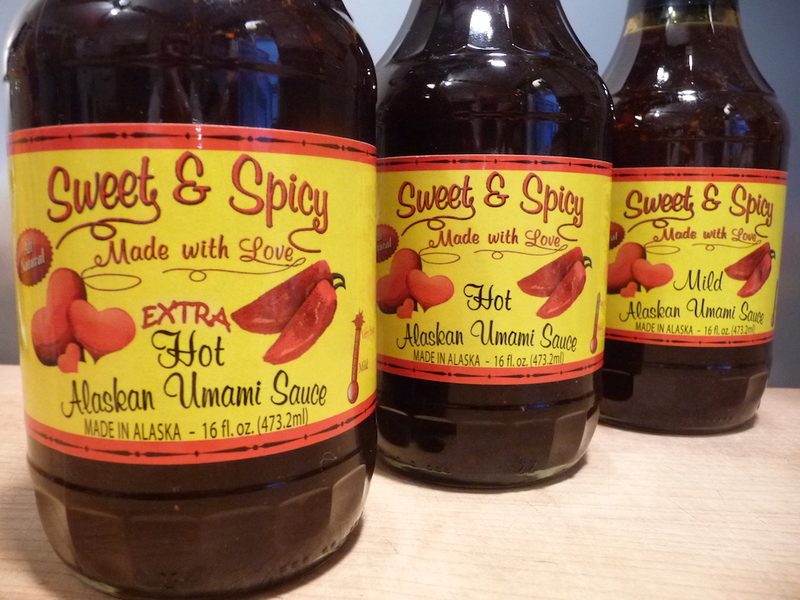 Pam Turner started Alaskan Umami Sauce as a wing sauce. It really came about because of my own picky taste buds, said Turner. 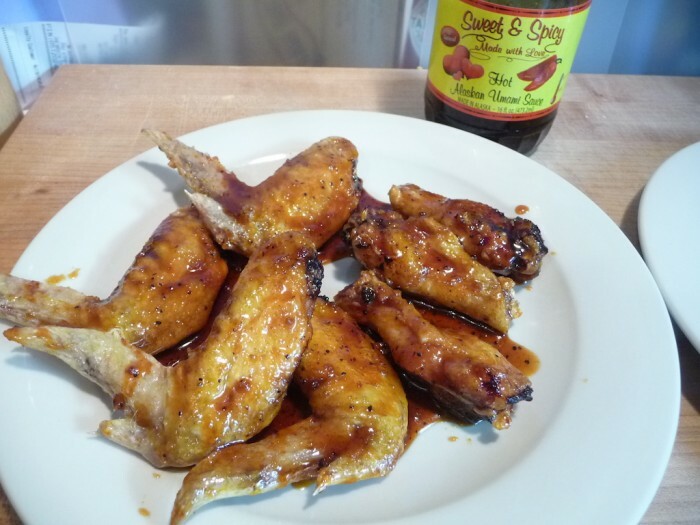 “I never could find a barbecue or other dipping sauce for meats that I liked very much, so I made my own.” I started making this sauce for chicken wings about 20 years ago, although it has been changed quite drastically over the years to what it is now. 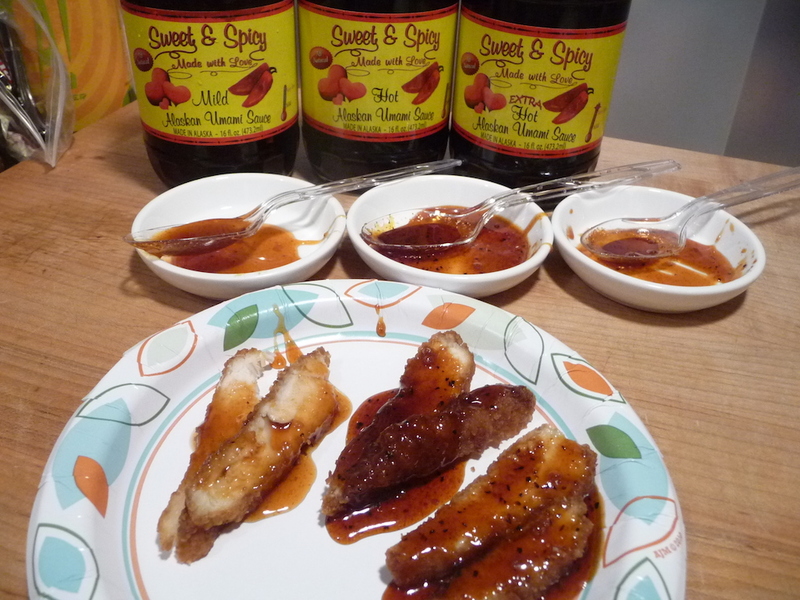 Facebook: Sweet & Spicy Alaskan Umami on Facebook. 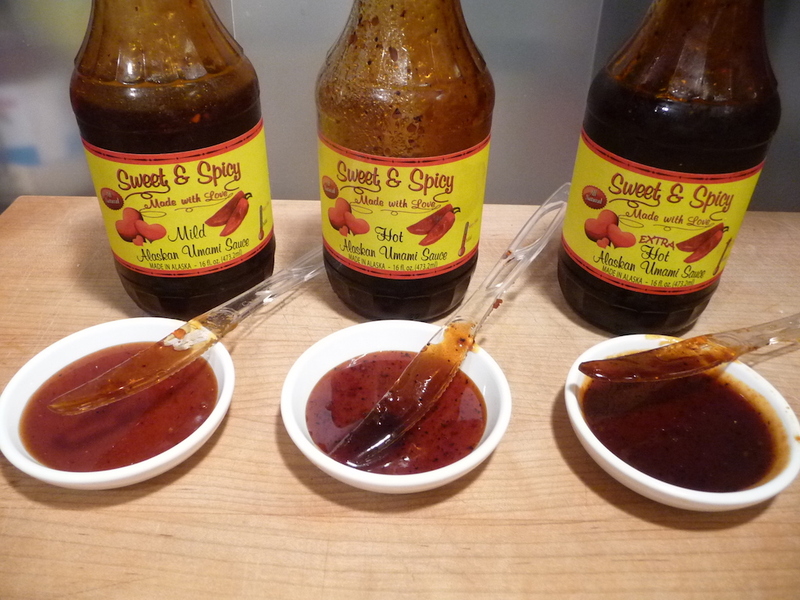 Twitter: Follow @Sweet_Spicy_BBQ on Twitter.